RFID Myths - What to believe? So if RFID is this good, why isn't everybody using it? And the above list, what do you think, truth or myth - has it been reported correctly, or is it all a horrible mythtake? Our view is that 90% of the information presented in the popular press is incorrect (or incomplete, or ambiguous or misleading), but that the remaining 10% is correct, and that 10% is going to have a dramatic effect on us all over the next ten years. So let us look at the above list in more detail. The short answer is that every item on the list contains a grain of truth (no pun intended). Here are the details. Well RFID chips are manufactured from pretty much the same process as any other integrated circuit. One significant difference is the packaging process, most RFID chips are presented without their plastic encapsulation. You get to see the "naked" chip. But although the chip is small, it needs an antennae to function, and the antennae makes the whole assembly, the tag, a whole lot bigger. An LF tag will be about the size of a beer bottle cap. A typical HF tag is about the size of a credit card. A UHF tag might be about three inches long, by about an inch wide, and perhaps a millimetre thick (excuse the mixed units). So yes, the chips are smaller than a grain of rice, but the tags are, unfortunately, much bigger than the chip. The manufacturers are working hard to make the chips smaller, and you will seen triumphant announcements in the press whenever they achieve a significant reduction in size. Why the excitement? Well a smaller chip does not mean a smaller tag, but it has an affect on price. It costs pretty much the same to manufacture a wafer, no matter how many chips. (Just as the print of a photo costs the same, not matter how many people are in the picture). So a smaller chip means more chips per wafer, which means lower cost, which is good. So perhaps a better headline would be "reduced cost of chips" (and therefore tags), rather than "reduced size of chips". The second point is that there are a new generation of chips being developed. These will be the next frequency range above UHF. They will truly enable smaller tags (smaller antennae), but the penalty for this will be lower read range. Even so, for specific applications, such a tag will have significant potential, even with a read range measured in mm. Yes, but only if you buy a million. Or two. Yes, but only if they are active tags. Which are not small. Or cheap. Well some data. But are you really sure you want to do that? Well RFID tags could track every box of tissue. But they are not good at two things, metal or water. So an aluminium can filled with water (and some secret ingredients) might present a significant technical challenge at this point. Yes, but it has to be a really small building and you have to use active tags, and they cannot be close to metal, (or metal studs in the wall) and you won't know where anything is in the building, and if you have anything you want to track in another building it can't be too close. Reading most of the tags is a good thing, but as one client pointed out, getting most of the tags is a bit like standing in front of the firing squad - and dodging most of the bullets. - you can put a reader on the door and track every item that moves in or out. Yes, but only if the person moving it wants you to track it, or can't find any metal foil. - Barcodes will be obsolete soon, replaced by RFID chips. Yes, but only where the price and size of the tag is not an issue, and where line of sight reading is not possible or convenient. So yes, for some very specific applications. - RFID chips are smaller than a grain of rice, and the tags are still pretty small, but not as small as barcoded labels. And active tags are a good bit bigger than passive tags. - RFID tags cost less than ten cents each. If you buy very large quantities. In quantities of less than a thousand, tags prices vary from two dollars to fifty dollars. 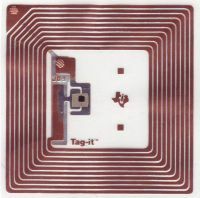 - RFID tags can be read at a range of 100 metres. If there is an active tag that is not close to any metal or liquid, and there is a clear (RF) line of site to the reader, which means no metal, no water. - RFID tags can store massive amounts of data. Well, some can contain data, but for most it is a few dozen characters. - RFID tags can track every soft drink can produced by every soft drink manufacturer (not just that one...) Yes, but the chip would have to be stood off from the can, or read at very close range. - you can walk into the lobby of a building and identify every asset in the building by pressing one button. Yes, but only for very small buildings. - you can put a reader on the door and track every item that moves in or out. Yes, if the person moving the item co-operates. - RFID tags are barcode killers. Barcodes will be dead in a couple of years, replaced by RFID chips. Yes, but only for certain applications. RFID is a powerful tool that is going to change the way that we live and work. RFID tags have significant benefits over barcoded tags for specific, but not all applications. We are still at the "bleeding edge" with this technology, but can expect significant technical improvements over the next few years. For many applications RFID is a mature and successful technology which should be employed today.